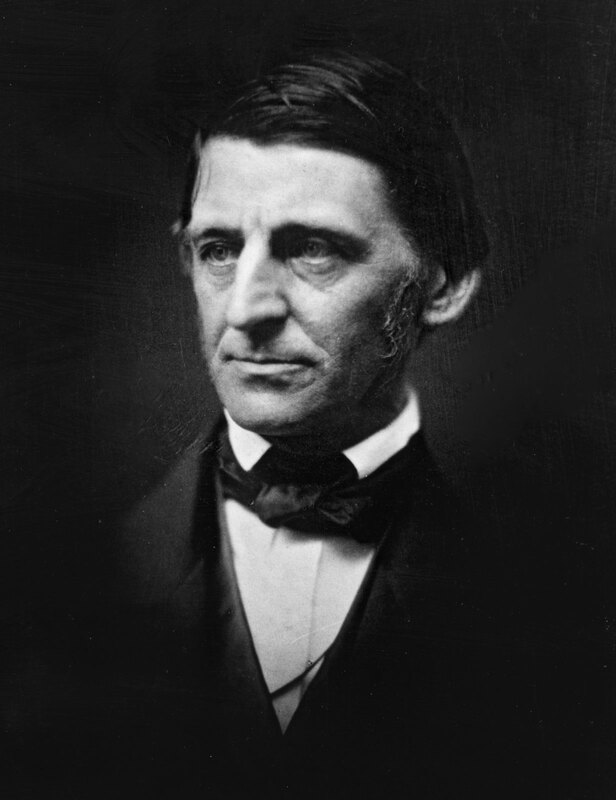 A n audio recording of this excerpt from “New England Reformers” by Ralph Waldo Emerson (1844) read by Douglas Storm. The same insatiable criticism may be traced in the efforts for the reform of Education. The popular education has been taxed with a want of truth and nature. It was complained that an education to things was not given. We are students of words: we are shut up in schools, and colleges, and recitation-rooms, for ten or fifteen years, and come out at last with a bag of wind, a memory of words, and do not know a thing. We cannot use our hands, or our legs, or our eyes, or our arms. We do not know an edible root in the woods, we cannot tell our course by the stars, nor the hour of the day by the sun. It is well if we can swim and skate. We are afraid of a horse, of a cow, of a dog, of a snake, of a spider. The Roman rule was, to teach a boy nothing that he could not learn standing. The old English rule was, ‘All summer in the field, and all winter in the study.’ And it seems as if a man should learn to plant, or to fish, or to hunt, that he might secure his subsistence at all events, and not be painful to his friends and fellow men. The lessons of science should be experimental also. The sight of the planet through a telescope, is worth all the course on astronomy: the shock of the electric spark in the elbow, out-values all the theories; the taste of the nitrous oxide, the firing of an artificial volcano, are better than volumes of chemistry. One of the traits of the new spirit, is the inquisition it fixed on our scholastic devotion to the dead languages. The ancient languages, with great beauty of structure, contain wonderful remains of genius, which draw, and always will draw, certain likeminded men, — Greek men, and Roman men, in all countries, to their study; but by a wonderful drowsiness of usage, they had exacted the study of all men. Once (say two centuries ago), Latin and Greek had a strict relation to all the science and culture there was in Europe, and the Mathematics had a momentary importance at some era of activity in physical science. These things became stereotyped as education, as the manner of men is. But the Good Spirit never cared for the colleges, and though all men and boys were now drilled in Latin, Greek, and Mathematics, it had quite left these shells high and dry on the beach, and was now creating and feeding other matters at other ends of the world. But in a hundred high schools and colleges, this warfare against common sense still goes on. Four, or six, or ten years, the pupil is parsing Greek and Latin, and as soon as he leaves the University, as it is ludicrously called, he shuts those books for the last time. Some thousands of young men are graduated at our colleges in this country every year, and the persons who, at forty years, still read Greek, can all be counted on your hand. I never met with ten. Four or five persons I have seen who read Plato. In alluding just now to our system of education, I spoke of the deadness of its details. But it is open to graver criticism than the palsy of its members: it is a system of despair. The disease with which the human mind now labors, is want of faith. Men do not believe in a power of education. We do not think we can speak to divine sentiments in man, and we do not try. We renounce all high aims. We believe that the defects of so many perverse and so many frivolous people, who make up society, are organic, and society is a hospital of incurables. A man of good sense but of little faith, whose compassion seemed to lead him to church as often as he went there, said to me; “that he liked to have concerts, and fairs, and churches, and other public amusements go on.” I am afraid the remark is too honest, and comes from the same origin as the maxim of the tyrant, “If you would rule the world quietly, you must keep it amused.” I notice too, that the ground on which eminent public servants urge the claims of popular education is fear: ‘This country is filling up with thousands and millions of voters, and you must educate them to keep them from our throats.’ We do not believe that any education, any system of philosophy, any influence of genius, will ever give depth of insight to a superficial mind. Having settled ourselves into this infidelity, our skill is expended to procure alleviations, diversion, opiates. We adorn the victim with manual skill, his tongue with languages, his body with inoffensive and comely manners. So have we cunningly hid the tragedy of limitation and inner death we cannot avert. Is it strange that society should be devoured by a secret melancholy, which breaks through all its smiles, and all its gayety and games? But even one step farther our infidelity has gone. It appears that some doubt is felt by good and wise men, whether really the happiness and probity of men is increased by the culture of the mind in those disciplines to which we give the name of education. Unhappily, too, the doubt comes from scholars, from persons who have tried these methods. In their experience, the scholar was not raised by the sacred thoughts amongst which he dwelt, but used them to selfish ends. He was a profane person, and became a showman, turning his gifts to a marketable use, and not to his own sustenance and growth. It was found that the intellect could be independently developed, that is, in separation from the man, as any single organ can be invigorated, and the result was monstrous. A canine appetite for knowledge was generated, which must still be fed, but was never satisfied, and this knowledge not being directed on action, never took the character of substantial, humane truth, blessing those whom it entered. It gave the scholar certain powers of expression, the power of speech, the power of poetry, of literary art, but it did not bring him to peace, or to beneficence.